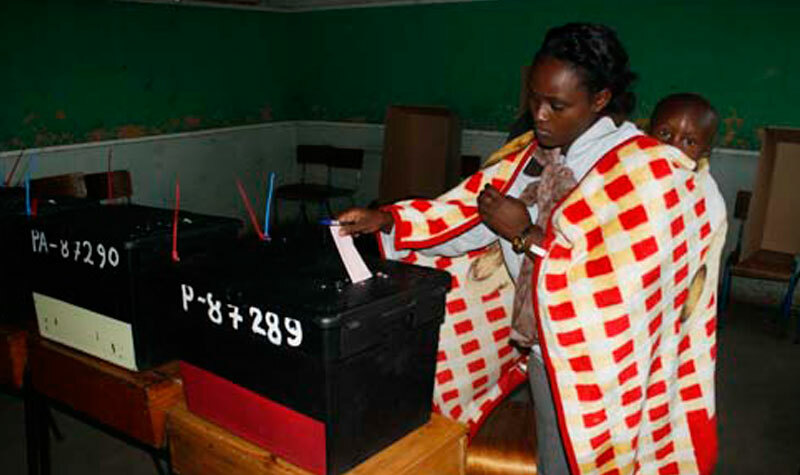 Kenyans don't go to the polls until Aug. 8, but election fever is already gripping the country. On Twitter, one trending hashtag is #NotWithMyVote, which people are adding to tweets about their political hopes and fears. Corruption has been a central theme in these tweets, and many Kenyans, arguing that corruption is holding back the nation's development, are now calling for the ouster of incumbent politicians. Twitter users have reason to be angry; according to a 2016 survey by PriceWaterhouseCoopers, Kenya is the third most corrupt country in the world. #NotWithMyVote should i vote for leaders who DAB????? I rather chew it?? Mecha was referring to a controversial campaign by the president to motivate young people to register to vote, #UhuruDabChallenge. As part of the promotion effort, Kenyatta recorded a video of dab moves at the State House with a popular local dance group called FBI. A national strike by doctors and lecturers is also influencing voters. Earlier this month, a court ruled that members of the Kenya Medical Practitioners Pharmacists and Dentists Union, a union body that governs all Kenyan doctors, should be jailed over the strike. According to a report by Interthoughts Consulting, commissioned by the Center for Multiparty Democracy in partnership with Germany's Konrad Adenauer Foundation, a majority of Kenyans would vote for any politician who gives them money. The study also found that politicians recoup the money spent bribing voters by stealing from the government, once in office. Will i stand by watch while my country is thrown into chaos by selfish leadership #NotWithMyVote I will pray and vote for good leadership . #NotWithMyVote will I allow leaders who sit back and watch as Kenyans starve while they run around in search of votes. Arap Kobilo endorsed a “better the devil you know” attitude, arguing that President Kenyatta and his vice president, William Ruto, represent a safer bet than the election's four opposition leaders, Raila Odinga, Musalia Mudavadi, Kalonzo Musyoka, and Moses Wentang'ula, who have formed the National Super Alliance to challenge the president's ruling coalition. The doctors’ strike has brought the nation's public health care system to a halt, and an unknown number of patients have died, as doctors continue to stay away from work. #NotWithMyVote will i Elect the same Old people who have been there ever since and they have brought no change in my country. #NotWithMyVote campaign is zero work, if we already have voting robots.The mental slavery syndrome should be declared national disaster. This article origionally apeared on Global Voices.